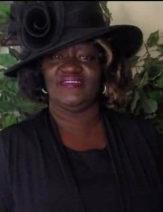 Ms. Helen Jackson, 59, of Charleston, SC, entered into eternal rest on Monday, February 5, 2019. The relatives and friends of Ms. Helen Loretta Jackson are invited to attend her Funeral Service 11:00 AM, Monday, February 11, 2019 at Old Ashley Baptist Association Center, 3275 Old Pond Road, Johns Island, SC. Interment - First Baptist Church of James Island Cemetery, Johns Island, SC. Viewing will be held Sunday, February 10, 2019 from 4:00 PM - 6:00 PM at the mortuary. Ms. Jackson is survived by her children, LaToya Jackson, Latonia Jackson, Reanda (Raheen) Scott, John Jackson, III, Michelle Jackson and Vantrelle Pratt-Miller; grandchildren and great-grandchildren; mother, Ethellen Frasier; siblings, Remus (Cynthia) Frasier, Anthony (Cheryl) Frasier, Rev. Bonita Saxby, Harry Frasier, Audrey (Rodney, Jr.) Kent; Jondella Bennett, Sara Cromwell, Leroy (Michelle) Pratt, Robert Pratt and Debra Alston; and a host of other relatives and friends.